Country and tejano music will be on tap as the city of Pharr pays tribute to its unique cross-cultural heritage during the annual HubPhest in early April. 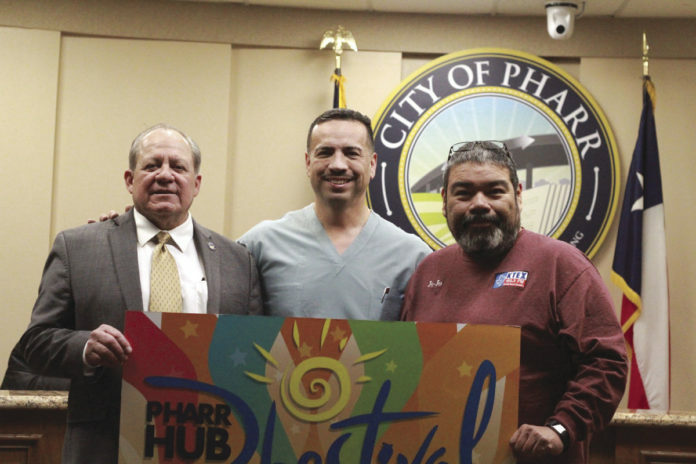 Pharr — long known as the Hub City — has put on the celebration for over a decade. During a press conference Wednesday, Mayor Ambrosio Hernandez said the tradition of “celebrating our Tejano Country roots,” will carry into this year. Since assuming office in May 2015, Hernandez has overseen the work behind bringing the event to the city and has encouraged a focus be placed not only on activities and performers, but safety as well. Entertainment as well as attendance, he said, gets better every year. An afternoon of nonstop musical performances and carnival rides is just a sliver of what’s promised this time around. Exploring the petting zoo and tasting plates from various food booths, according to Pharr officials, make the “phestival” well worth a trip. No stranger to the Rio Grande Valley, country musician Easton Corbin returns as headliner. His first visit took place in 2010, which radio personality Jojo from KTEX-FM attributed to having played a part in the creation and mass success of the station’s 10 Man Jam. Later this year, the “jam” celebrates its 8th year. Texas Dezire, Arroyo Band, Drew & the Dancehall Dreamers, Little Joe y La Familia and Phar native Bo Garza are a few other artists set to perform. The lineup reflects a “diverse showcase … from country to latin,” said Hernandez, reflecting the community’s main interests. Big-time grillers can look forward to a Cookoff sanctioned by the International Barbeque Cookers Association. The event kicks off at 4 p.m. Saturday, April 7, in downtown Pharr. Admission is free before 5 p.m. and $5 thereafter. Visit hubphest.com for more information.